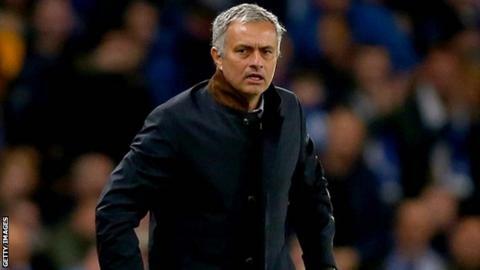 Chelsea boss Jose Mourinho has had his appeal against a £50,000 fine and a suspended one-game stadium ban dismissed by the Football Association. Mourinho's stadium ban will be invoked if he is guilty of further misconduct relating to media comments. He admitted another misconduct charge after being sent off against West Ham. The 52-year-old has been given a one-match stadium ban with immediate effect and also fined £40,000 for speaking to referee Jon Moss at half-time during the 2-1 defeat by the Hammers. He is set to miss this Saturday's game against Stoke unless he appeals against the punishment. The FA said that the two charges were regarded as different types of misconduct, so the latest charge, incurred after the 2-1 defeat at West Ham on 24 October, would not trigger the suspended stadium ban received for his behaviour following the 3-1 loss at home to Southampton on 3 October. The FA charges have come during a troubled season for Mourinho. Chelsea have made the worst start to a season by any team defending a Premier League title, having won only three of their 11 matches, and are are 15th in the table. Mourinho has denied suggestions of a player revolt, but is also facing a legal claim by former first-team doctor Eva Carneiro after he criticised her for treating Eden Hazard during the 2-2 draw with Swansea on the opening day of the season. The former Real Madrid, Inter and Porto boss was cleared by the FA of making discriminatory comments towards Carneiro, a decision which itself drew censure from FA board member Heather Rabbatts. Despite mounting problems, Mourinho said he would fight his cause after a 3-1 defeat by Liverpool on Saturday. Chelsea beat Dynamo Kiev 2-1 in the Champions League on Wednesday, their first win in five games.